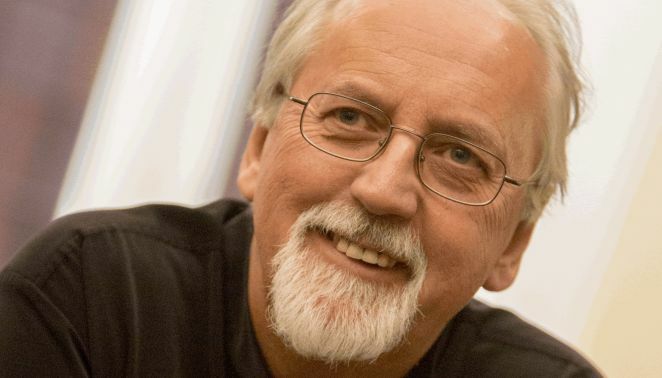 Jeffrey Skidmore’s reputation as one of the UK’s leading choral directors and an ardent advocate of the importance of singing in people’s lives today is rooted in his work with Ex Cathedra, the ensemble he founded over 45 years ago. Jeffrey read music at Magdalen College, Oxford, before returning to his native Birmingham to develop Ex Cathedra into the internationally-acclaimed choral group it has become today. Jeffrey’s driving passion has been to refresh and reinvigorate the choral repertoire and to make it accessible to as many people as possible. He and Ex Cathedra have long been known for exciting and innovative but always attractive programming, underpinned by thorough research and preparation. Under his direction, Ex Cathedra has also shown an enduring commitment to vocal education from its groundbreaking children’s singing programme, Singing Playgrounds, to the nurturing of professional singers at the start of their careers. Jeffrey is a pioneer in the field of research and performance of choral works of the 16th, 17th and 18th centuries, both in the old and new worlds, and has won wide acclaim for his recordings of French and Latin American Baroque music with Ex Cathedra. An Honorary Fellow at Birmingham Conservatoire and a Research Fellow at the University of Birmingham, he has prepared new performing editions of works by Araujo, Charpentier, Lalande, Monteverdi and Rameau, amongst others. With Ex Cathedra, Jeffrey has commissioned more than thirty new works and conducted many world premieres by composers including Sally Beamish, Fyfe Hutchins, Gabriel Jackson, John Joubert, James MacMillan, Roxanna Panufnik, Alec Roth, Daryl Runswick, Peter Sculthorpe, Philip Shepherd, Peter Wiegold and Roderick Williams. As director of Ex Cathedra and its associated Consort and Baroque Orchestra, Jeffrey has appeared in many concert halls and festivals across the UK and overseas. He has made a number of highly-acclaimed recordings ranging from Renaissance polyphony to Latin American and French Baroque. He has also worked with other ensembles including the City of Birmingham Symphony Orchestra, the Orchestra of the Age of Enlightenment, Aalborg Sinfoniorkester, the Irish Baroque Orchestra, Sinfonia New York, and the BBC Singers. In the field of opera he has worked with Birmingham Opera Company; Welsh National Opera; Marc Minkowski and David McVicker on the 2004 production of Semele at the Théâtre des Champs-Elysées in Paris; and has given the first performances in modern times of the French Baroque operas Zaïde by Royer and Isis by Lully. Jeffrey is Artistic Director of the Early Music programme at Birmingham Conservatoire, and is a regular contributor to the choral programme at Dartington International Summer School and to a wide range of choral workshops and summer schools at home and abroad, most recently as ‘professor’ of ‘coro barroco’ in the 32nd Festival of Music in Curitiba, Brazil. Jeffrey was awarded an OBE in 2015 for services to choral music and an honorary doctorate by the University of Birmingham in 2017. Read an interview with Jeffrey.